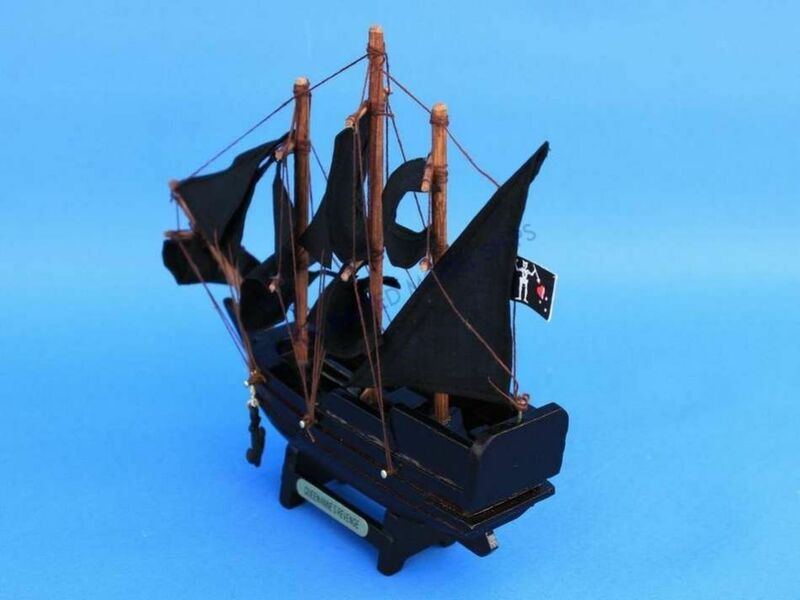 Wooden Blackbeard's Queen Anne's Revenge Model Pirate Ship 7"
Release your inner pirate with this adorable tall ship model of the Queen Anne's Revenge, captained by the infamous Blackbeard! 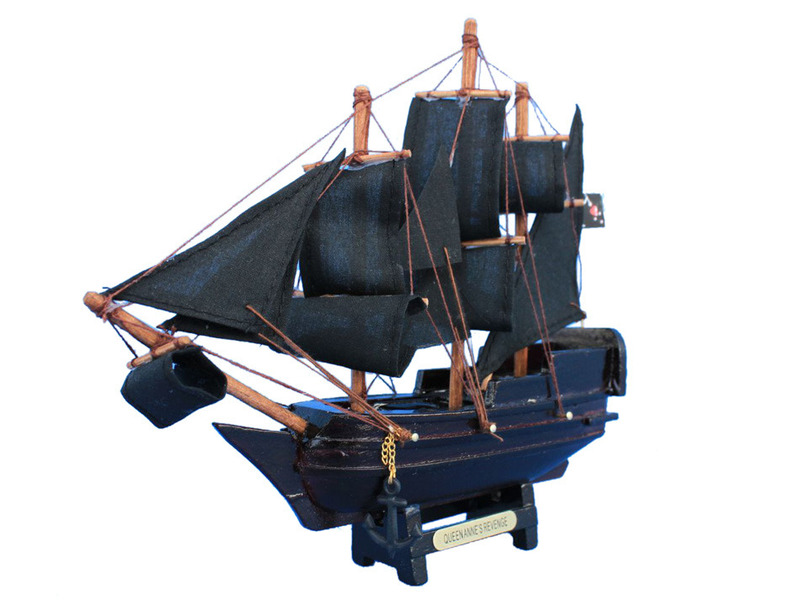 Handcrafted out of the finest woods, this miniature boat rests easily upon any desk or shelf. 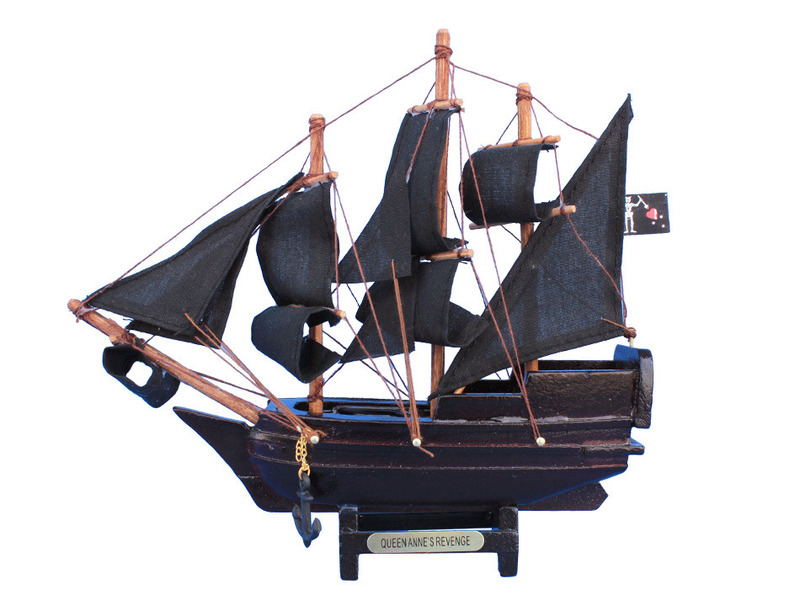 Add a touch of pirate decor and adventurous spirit to any office or room with this classic pirate ship model. NOTE: This item is small, only 7". 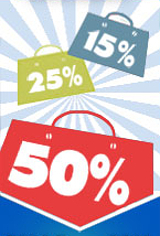 Please measure this size yourself to ensure it is appropriate for your intended purchase. Built in 1710, the Concord enjoyed a brief life as an English ship before being captured by French forces in 1711. Constructed as a frigate, the ship was modified by the French to hold cargo, in particular slaves, which at the time was a burgeoning trade business in western France. Making three runs over the course of the next decade, La Concorde would depart from Nantes, sail to the west coast of Africa to trade for slaves, and from there continue along the trans-Atlantic Middle Passage to the islands of the Caribbean. While slave trading voyages were successful in 1713 and again in 1715, the 1717 journey would be the last for La Concorde. Leaving Nantes on November 24, 1717, La Concorde departed for the African coast arriving at the port of Judas on July 8. After making it across the Middle Passage, approximately 100 miles out from the island of Martinique, La Concorde and the pirate Edward Teach met for the first time. After being fired upon, Captain Dosset surrendered his ship almost immediately and she was taken to the Grenadine Islands. After capturing La Concorde near the island of Martinique , Captain Hornigold turned the ship over to Teach, better known as Blackbeard, whom he had met at New Providence Island. After adding cannons and his menacing flag, and renaming her the Queen Anne’s Revenge, she became Blackbeard’s flagship. After sinking a French ship off the coast of St. Christopher’s Island, Blackbeard resumed attacks on British, Dutch, and Portuguese merchant and slave ships throughout the area. In March of 1718, off the coast of Belize, Blackbeard and his crew attacked the sloop Adventure. Convincing the captain and several of the crew to join with him, Blackbeard added the ship to his fleet and ventured out for further conquest. In May of 1718 Blackbeard and his pirates arrived in Charleston, South Carolina where the Queen Anne’s Revenge and three sloops came to blockade the port. While awaiting medical supplies Blackbeard raided local ships, taking a number of hostages. Once the medicine was supplied the hostages were released, and Blackbeard attempted to sail up North Carolina’s Old Topsail Inlet, where the Queen Anne’s Revenge ran aground, snapped her main mast and severely damaged her hull timbers, and eventually sank . After selecting a crew of his most trusted sailors and gathering the best of the bounty, Blackbeard escaped aboard the Adventure, leaving the Queen Anne’s Revenge to her fate. In 1996 the wreckage of the Queen Anne’s Revenge was discovered off the coast of North Carolina’s Fort Macon State Park. 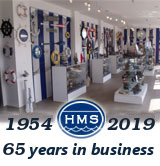 Over 16,000 artifacts have been recovered, including several cannons, and in 2000 and 2001 live underwater video was used for educational purposes. In 2006 more artifacts were discovered at the wreck, and by the end of 2007 almost a third of the ship had been explored. Though there was some controversy as to whether or not the wreckage was in fact the Queen Anne’s Revenge, in 2011 it was confirmed, bringing the history and legacy of both the ship and her captain back to the forefront of popular culture.